The Bay Area Dental Hygienist Society participated in the Angleton-Danbury Community Health Fair on Saturday, October 26, 1996 from 10am to 1 pm. “The response was great”, according to Frann Leonard. Around a thousand people participated and Bay Area presented them with information on dental health that included samples and information from the Oregon Mint Snuff Company. About a hundred sample packages were distributed. October is also the National Dental Hygiene Month, so this health fair was a big boost for area dental hygienists and lots of information was handed out. 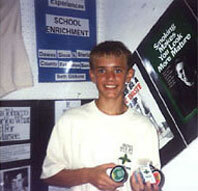 Other sponsors were Proctor & Gamble and Warner-Lambert. In just three short hours, Bay Area was able to provide participants with all types of dental hygiene information. Their very own “walking toothpaste” handed out approximately 500 toothbrushes along with information on oral care ranging from children to the elderly. “The National Cancer Institute provided Bay Area with a very graphic pamphlet entitled ‘Spitting Into the Wind’,” stated Leonard. 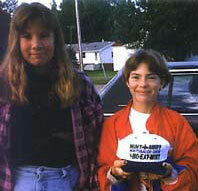 “This included facts about dip and chew and what is really included in smokeless tobacco products. This included formaldehyde, polonium 210 (a nuclear waste) nicotine, cancer causing chemicals as well as radioactive elements. This handout was given along with samples provided by [the Oregon Mint Snuff Company]. There was such a good response that area hygienists contacted several local retailers and requested that this product be stocked. Each hygienist that participated also took samples back to their offices to distribute to patients that currently use smokeless tobacco products. Thank you so much for the samples of Mint Snuff, program information, caps and t-shirts. 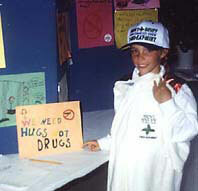 Our display at the health fair in Carencro, LA on March 8, 1997 was a huge success! Public interest in [Mint Snuff] was great and we distributed nearly everything you sent us. Enclosed is a photo of our display with Catherine Guidry, dental assistant and [myself]. Thank you very much once again! 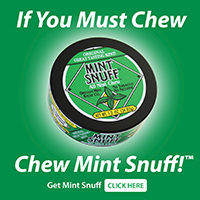 Mint Snuff is a non-tobacco, herbal chew made of mint instead of tobacco. Safe to eat, safe to swallow.